Do we need to make reservations? How can we do that? We only take reservations for vehicles that need to go on the boat or if you would like to take a TOUR. Passenger space is first come, first served, so please note we do not take any kind of passenger reservations. To make a vehicle or tour reservation or to check availability, call us at (231) 547-2311. Note that tours may still be available without reservations. In the summer, you can call the tour office directly at (231)448-2500 for reservations. We do not make reservations by e-mail. How soon should we call to reserve space for our car? We generally begin taking reservations in the middle of January. For hunting season, we allow reservations to be made before the new year. Otherwise, we can make reservations for the whole year, so calling us ASAP is the best idea. NOTE: If you plan on traveling with a vehicle on any Saturday (especially during June, July or August) you should plan on making your vehicle reservations right away (I.e. In January or February) to get a space. Yes, spaces do fill up that quick. Check the News/Info on our Home Page for important dates and information. Where do we park our vehicle? Please check in at least 1 hour prior to departure time to purchase tickets, transfer luggage and park your vehicle. Checking in at least 1 hour prior to departure will allow you time to check in your luggage, purchase your passenger tickets, your parking permit (if traveling overnight), and to park your vehicle. There is a shuttle for drivers only to and from our overnight lots (a private apartment complex and the Charlevoix Airport). If parking in one of our overnight lots, you must first check in to our office to purchase a permit. The shuttle bus will depart 30 min prior to boat departure time from our overnight lot and 40 minutes prior to boat departure time from the Charlevoix Airport. Please leave all pets, passengers and luggage at the ferry dock to park vehicle. If you are running late and miss the shuttle service or would prefer we park your vehicle for you, we do offer a one way valet service to take your car out to one of our overnight parking lots for $25. Day parking is available in two downtown parking lots. One of our office staff will be happy to direct you to one of those lots when you arrive. Both lots are within walking distance of our dock. Our mainland office is in downtown Charlevoix on the south side of the Bridge. Please see map below, or Contact Us for more information. Get driving directions. Do you have a waiting list for vehicles? We do not have a waiting list for open vehicle spaces on the boat. What we do have is called “stand-by” and requires a confirmed reservation following the date of the stand-by reservation. EXAMPLE: You would like to take your vehicle on Monday at 8:30am, but the boat is booked full. The next available space is Tuesday at 2:30pm, so what we can do is put you on stand-by for Monday at 8:30am and confirm your space on Tuesday at 2:30pm. As a stand-by, your vehicle will be considered for loading if there is space left over after confirmed vehicles and freight are loaded. Most times in the summer, multiple stand-by vehicles can be loaded. If your vehicle doesn’t fit as a stand-by on the Monday 8:30am departure, then it will automatically be placed as a stand-by on the next departure (whichever boat is next), until your confirmed departure of Tuesday at 2:30pm. Canceling or missing a stand-by reservation will result in the same penalties as missing a confirmed booking. You do not need to travel on the same boat as your vehicle, but are responsible for removing your vehicle from our dock immediately following its arrival. IMPORTANT: The difference between a wait list and our stand-by system is a stand-by vehicle will not require a notification call when a space is available on the boat, it will be included on the boat if space is available. I.e., you may arrive expecting to be a stand-by and find out your vehicle has a confirmed space. Remember you must show up for a Stand-By reservation. It takes just over 2 hours to make the 32 mile trip. We have two boats, the M/V Beaver Islander and the M/V Emerald Isle. The Emerald Isle is the newer of the two and is wheelchair accessible, with a chair lift to the first passenger deck and handicap accessible restroom. The Beaver Islander does not have have a lift and passengers must walk up stairs to reach deck. Yes, pets are allowed on our boats if they are on a short leash and kept away from other passengers. Pet tickets are $12 one-way and can be purchased in our office. Pets are not allowed inside the passenger cabin. We also have a limited number of kennels that are kept on the car deck, for the same price. You do not have access to the car deck while the boat is underway. You may also leave your pet in your vehicle – away from our driver – at no charge. Please also note; pets are not allowed in our indoor waiting area or on the shuttle bus. Beaver Island Boat Company assumes no responsibility for the actions of pets. We also have PET POLICY BROCHURES upon request. We have vending machines with water, candy, soda, chips, and other vending-type items for sale. You are welcome to bring food and drink items aboard. Alcoholic beverages are allowed as well as small carry on coolers. What is considered freight? What do you charge for freight? Ticketed persons traveling on the same trip that items are being shipped are allowed up to fifty (50) pounds of luggage. Anything besides standard luggage is considered as excess freight and must be declared at check-in. Freight is $0.13 per pound ($5.00 minimum charge.) Each passenger is also allowed one (1) backpack-size carry-on. Most, but not all items placed on the luggage rack are charged according to weight. BIBCO reserves the right to charge itemized price or charge by weight, and also to adjust charges according to item value. For extensive amounts of freight/luggage, arrive 1½ hours before the departure and you may purchase a “cage” (4’x’4’x6′) for $72.50. Cages are first come, first serve. See our FREIGHT page for more information. Note that any and all luggage will be charged as freight to customers not taking the same boat. What is there to do on Beaver Island? 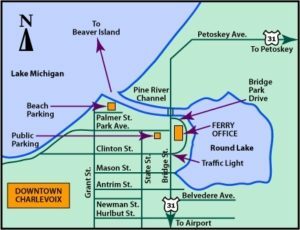 Beaver Island is home to 2 lighthouses, 7 inland lakes, 2 campgrounds, hiking & biking trails, fishing, 2 museums, 7 hotels/B&B’s, 6 restaurants, various shops and numerous rental cottages. You can rent kayaks, bikes and cars; go golfing, SCUBA diving; charter a boat to the outer islands of the Beaver Archipelago or take one of our GUIDED ISLAND TOURS to see the island. Beaver Island is 53 square miles and has over 100 miles of roads, so there is plenty to see! Smoking is now prohibited on all our vessels, docks, offices and surrounding buildings.